Sewerage and water supply for a private house. Ukraine and all world. Nowadays, modern houses have all the necessary facilities inside. Most often, for convenience, there are 2-3 bathrooms in a private house: at the entrance, near a guest room and near a master bedroom. While being in a bathroom or a toilet, residents perform various actions almost automatically, without thinking about their interaction with a complex structure. In the process of house refining, most often the attention is paid to the interior design, the arrangement of furniture and utensils. But this is all secondary: in order to organize proper living conditions, it is necessary to thoroughly design the basic engineering systems, and among them – water supply and sewerage. According to statistic data, only about 5% of the population, who live in private houses or cottages, can connect their houses to central water supply and sewage systems. It is difficult to separate these two systems, since they are closely interconnected and constantly interact. More and more house owners are installing autonomous sewage and water supply systems. Sand or sandy loam – such type of soil allows to build a wet pit or a septic tank – an underground tank with impenetrable bins and filtering material. It is most often round-shaped, made of brick, RC rings or concrete. In order to have an access to the inside of the septic tank, we mount a manhole with a diameter of about 50 cm on the surface. Clay, loam or peat – these types of soil have a high level of groundwater, so the only way is to install a storage tank. You can also use a combined treatment plant. Pipes with a diameter of 110 mm are designed to drain from the toilet, vertical standpipe, vent pipe, as well as the main drain (depending on the points for the collection of waste water). Siphons are located after each element of plumbing (except the toilet). They provide protection from sewage odors coming the drain hole and serve as a sort of septic tank for waste. Some plumbing equipment is designed in such way that part of the equipment serves as a siphon and can be connected without installing a separate siphon (gully and toilet). Gullies are installed in the floor. They are designed to receive and discharge waste water into a hidden sewer. Can be of different forms: square, rectangular or round. Access panel is an indispensable element of the internal sewage system (especially the one in a kitchen), that is used to service the pipes or clean with a cable. It is recommended to locate it in hidden places or behind decorative elements. Vacuum valves are elements of a vacuum system that allow you to regulate or block completely the flow of gas into the vacuum system. Sometimes they can serve as an alternative solution to the vent pipe. Pumps they are necessary only in those cases when the independent movement of wastewaters is impossible due to any difficulties. A prerequisite for domestic sewage is the presence of a sewage riser. It is designed for proper operation of the sewage system, and prevents water plugs, which lead to unpleasant odors from the drain holes. This is due to the fact that all the air comes out through the roof thanks to the sewage riser. A prerequisite for the installation of such pipe – it must be installed vertically! It is important to know! All wastewater is free-flowing, therefore, to avoid stagnation of the discharge inside the pipes and, as a result, unpleasant odor and blockages, it is necessary to install the drain at an angle of 2 cm per running meter. 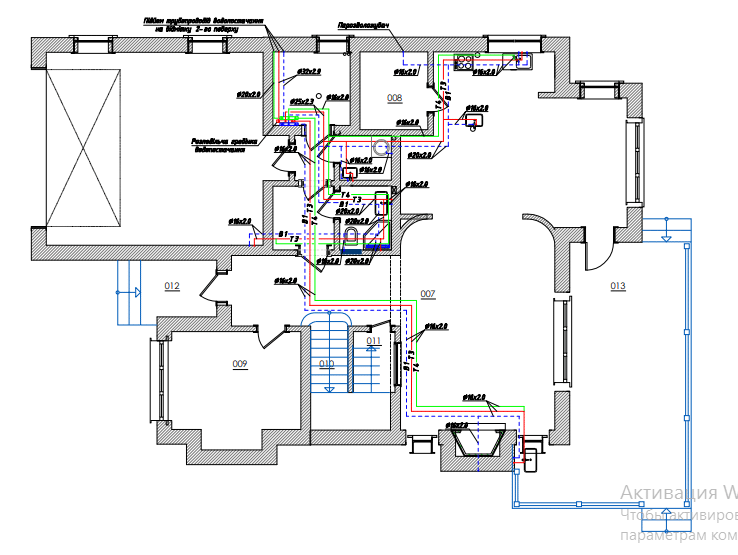 Initially, you should pay attention to the location of plumbing in a house. A big distance between a standpipe and a sanitary device (especially the toilet) will complicate the installation of sewage as an engineering system. A small length of the pipeline will not allow you to have the required incline and discharge waste may retain in this gap, leading to clogs. To ensure the required degree of incline of the pipe, we need to hide it behind a decorative box or raise the floor level. This will increase the installation time and cost. 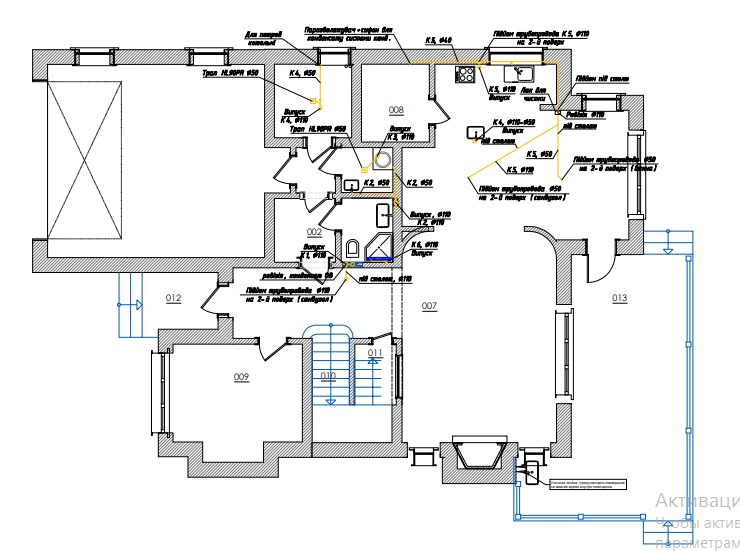 In the design of a sewage project, it is desirable to place bathrooms of a house with several floors under each other or in a mirror-like position relative to the riser. This simplifies the process of laying pipes, and requires the presence of only one funnel standpipe. All drain pipes should be as remote as possible from places where people spend their time most often — bedrooms, living rooms or children’s rooms. If the drain pipe is still placed near the living areas, it must be covered with noiseproof material. Sump – it is an engineering construction, the main purpose of which is to clean the waste from the sewage system; single or multicompartment anaerobic septic tank; an aeration tank is the reservoir through which flows discharged water mixed with activated sludge, and this process allows it to be cleaned. All of these constructions have different drainage water treatment efficiency, which varies within 60 — 99%. Pipes with a diameter of 110 mm in order to move wastewater from a house to a storage tank. If the building has a significant number of sanitary facilities, experts recommend to use a 150 mm pipe for a drain. For the rational use of outdoor sewage pipes and in order to prevent them from freezing, experts advise not only to install them below the soil freezing level, but also additionally insulate them. Wells – they are necessary for service checks and, if some cases, for cleaning or purging the system. They can also be used to monitor the condition of pipes in specific areas. Various filters such as wells, oxidation ponds or filtration fields are used for natural biological treatment in order to prevent harmful substances from entering the wastewater. Drainage pumps are necessary if there is a complex landscape on the land or there are already engineering communications intersecting with the sewage system and that complicates its process. Also the external sewage system includes storm drain. Inside the drainage system, an additional tank should be installed, as well as corrugated pipes that have perforated walls in the geotextile winding. Additionally, ground trays can be added to storm sewers, which will serve as a container for collecting water on the surface. It will also be appropriate to install yard gulleys that are equipped with filter mediums for sand. Initially, the project of the entire system is designed and calculated for particular number of residents and sanitary equipment. If these numbers increase, the amount of waste will increase accordingly. In this case, it is necessary to take into account that the load on the cleaning tank will be increased. The difference between centralized and autonomous sewage systems in the house is only at the final point, where waste and sewage will be dumped. But we should remember that the sewage treatment plant should not be in a long downtime. Otherwise, it will lead to stagnation of fluid in them and improper operation in the future. fitting pipes – used to connect or branch pipes. In addition to basic elements (elbows, pipe sockets and adapters) in water supply system we also use taps, valves and manifolds. When designing, you should also take into account the number of all sanitary fittings, as well as their water consumption, in order to bring pipes of the correct diameter to them. With proper calculations, the speed of water movement in the water supply pipes should be in the range of 0.4 — 0.5 m/s. This will allow the system to function correctly and eliminate problems – insufficient pressure head or loud noise in the pipe. Water distribution is carried out with the help of a special collector, and its choice depends on the number of branches in the rooms to which water will be supplied. The tank for hot water should be chosen, taking into account the number of residents and the required amount of hot water for them. It is recommended to equip it with a mixing unit that will supply water of a certain temperature (about 40 °C), which can be adjusted independently, even if it differs from the temperature in the hot water tank. This prevents any cases of burns if water gets too hot, even in the absence of thermostatic taps. An example of an implementation of a water supply system at a Vita Poshtova object. An important factor in the water supply system in a house is recirculation. The constant movement of hot water along a small circuit ensures that when residents open the tap, they immediately receive hot water, without the need for additional water wasting. To get this result, you should install a recirculation pump in the system. Thus, the system of heating, water supply and sanitation of a private house inevitably interact with each other. Such system requires a distribution manifold or special dies, the main task of which is to divide the water supply of different temperatures into the system. With such project, it is necessary to determine the depth of the pipeline from the building to the trunk line. Also it is obligatory to install a shutoff valve to stop the flow of water into a house, and in front of it you need to «embed» a tap to drain the water. It is necessary for future repairs if the system fails, for servicing, installing new pipes or plumbing. To prevent breakage or corrosion, these items are placed in a specially constructed case. Experts also recommend installing a shutoff valve in front of each device that uses water in its work – an instantaneous water heater, a boiler, a drain barrel, etc. Normally, the valves are in the “open” position. If residents need to leave a house for a long time, they shut valves, stopping the flow of water. It is applied to both the water supply system and heating. Regardless of the type of water supply to the house, you need to remember about the water treatment system, which will provide residents with clean water suitable for drinking. One of the main elements that is present in both systems are pipes. Plastic pipes are usually used for sewage. Due to their ideally smooth inner surface, such pipes practically do not clog and corrosion does not appear on them, in contrast to the cast-iron pipeline. In addition, the installation of plastic pipes and their further replacement or service are much easier and faster. Given these advantages, they are more rational. Polypropylene or polyethylene pipes are used for the water supply system. Various salts, debris and scale do not settle on their inner walls. It is highly important to remember! The sewage and water supply systems interact with each other. Therefore, the design of both systems should be done simultaneously. These systems can be used all year round or periodically. In the case of a long absence of residents (if it is, for example, a summerhouse or you need to go on vacation), it is absolutely necessary to take care of high-quality and proper preservation of absolutely all existing pipelines, which will be regulated with the help of shutoff valves until the next use. This will help to avoid any leakage if a breakthrough or breach occurs. distribution manifolds for the internal circuits of the cold and hot water supply. To create a project of water supply and sewage systems of a private house, to carry out the selection and installation of all elements, all by yourself – is a very difficult task. Due to the lack of necessary knowledge and skills, there is a high risk to make serious mistakes that will lead to malfunctioning of all systems, as a result, all residents will get a lot of inconvenience. That is why in this matter it is better to rely on highly qualified specialists. In this case, resources of artificial origin – a well or a water borehole, and natural resources – a river or a lake can be used as a source of water. But more often, in order to provide full-fledged water supply to the house, it is recommended to drill a borehole, not far from the building, the depth of which varies from 25 to 50 meters. Only such depth will allow to obtain water without toxic and harmful substances, since the soil itself works as a kind of sorbent. In case of using a sand well or borehole for water supply, the features of the water layer make it possible to use it for 10–15 years. After the end of this period it is necessary to re-drill the deeper well. The sore spot in the system for water supply is a well head. That is why, it is often installed on the caisson, and the pipes are deepened by one and a half meters or even more. A mandatory factor in the design of water treatment system is the presence of filter materials that ensure the absence of various mechanical impurities in water. We highly recommend before using any water, not only for household needs, but also for cooking and drinking, to make a sanitary-epidemiological test and find out the quality of water in order to ensure its safety for health. A pump is what is responsible for the proper water supply to a house. It can be external or submersible. Pumps are intended for raising and supplying water to a building through the pipeline, and for its maintenance, we install a metal or plastic tank (caisson). With constant power supply, this ensures uninterrupted water supply to the house. If residents want to get autonomous operation of the system and a constant supply of water, in this case we recommend to install a domestic water-pumping station. The presence of an automation unit and a hydraulic accumulator allows to have an uninterrupted water supply to a house for a few hours, even if the system breaks down. When choosing a pump, you should definitely take into account its performance. Its capacity should be calculated in such way that the amount of water flowing through the pump group is equal to the half of load of short-term work of all available plumbing points. Attention! Installation of the water supply system must be carried out only after the approval of a plan and the consent of the local authorities. It should be done during the main planning and designing of a building. In the case when a private house is already built, all its characteristics must be taken into account.